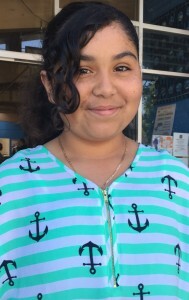 Claudia Urbina, 11, a Westlake Elementary student, calls her time at Boys & Girls Clubs of Santa Cruz County, as “Claudia 101” — meaning that she learns a lot about herself and others learn a lot about her. Claudia, a member since age 6, comes to the Downtown Clubhouse everyday after school and in the summer. She likes seeing her friends, swimming in the pool and doing her homework at the Clubhouse. But for Claudia, whose sister Coral is a member of the Teen Club, said she tries to give as much as she gets during her time at the Clubhouse. “My responsibility is to make sure the younger kids follow in good footsteps and make good choices,” she said.